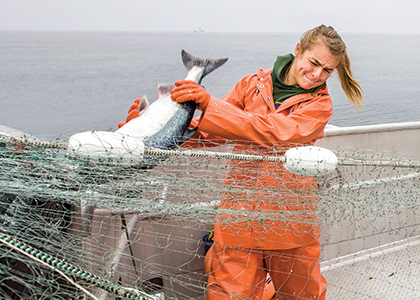 Fisheries and fashion unite for alumna honored by Forbes Magazine. 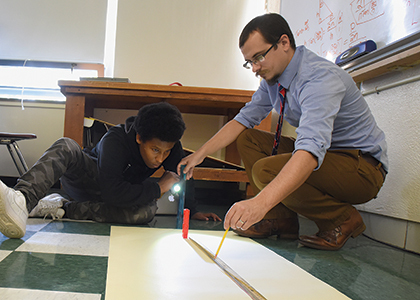 Vermont Teacher of the Year helps his students find success in math. Alumnus takes central role in uniting LGBTQ alumni and supporting Prism Center on campus. U.S. Tennis Association honors alumnus for leadership and advocacy for the sport. 'Shark Tank' Effect Real For SAP! Alumnus Simeon Marsalis explores UVM experience, history in debut novel. Distinguished military career followed UVM Rescue founding member's college days. Italy to Venezuela and many points in-between, Claudia Serwer ’67 built her career with the U.S. Foreign Service. Yes, it’s OK to be a young Republican at UVM. Jason Maulucci ’17 went straight from student government president to staffer for Vermont’s governor. Greg Huse ’94 cares for sacred ground as urban forester at Arlington National Cemetery. There was just one choice for set designer on Randa Karambelas’s NYC theater production this fall—the professor who inspired her years ago. Greening up rooftops across D.C.
Alumna/longtime UVM staff member helps build healthy relationships with students and their Burlington neighbors. Architectural photographer turns his eye to the sky for striking photographic images of airport traffic. Young grad is making a name for himself in food-rich New Orleans with his Good Bird sandwich shop. As a U.S. Supreme Court Fellow, Caryn Devins ’10 has earned a rare chance to gain experience at the highest level of her profession. Fighting fires to creating information management systems critical to protecting wild lands, Steve Boutcher ’82 has built a successful career with the U.S. Forest Service. FBI agent Ted Cacioppi ’91 was arresting officer when the infamous Bernie Madoff's elaborate financial swindle came unraveled. Doctorate in chemistry informs alum's product innovation as a co-founder/owner of Vermont-based Citizen Cider. From Brooklyn to San Francisco, young grad has built his career by helping Whole Foods walk the walk as an environmentally sustainable business. Fashion and function blend in alumna's advocacy for clothing tailored to differently-abled youth. Alumna's organization empowers youth, builds communities through basketball. Alumna trades television news work for the whirlwind of presidential politics with the Bernie Sanders campaign. Young grads' youth organization rooted in UVM entrepreneurial leadership course. Jackson Renshaw ’11 offers healthy (and tasty) choices by parking his food truck in Boston's tougher neighborhoods. Penelope Easton ’44 reflects back on post-war years promoting better nutrition among Alaka's native people.